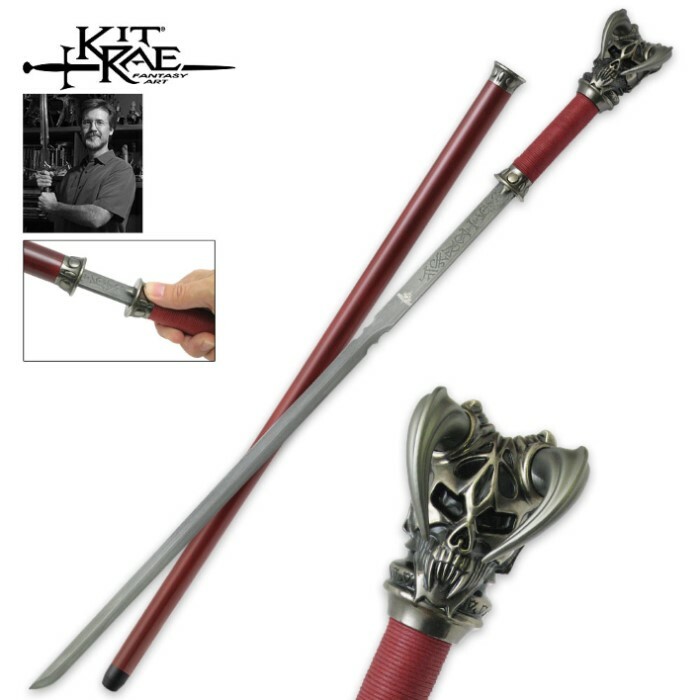 You have to add the new Vorthelok Forged Damascus Sword Cane from designer extraordinaire Kit Rae to your sword collection! 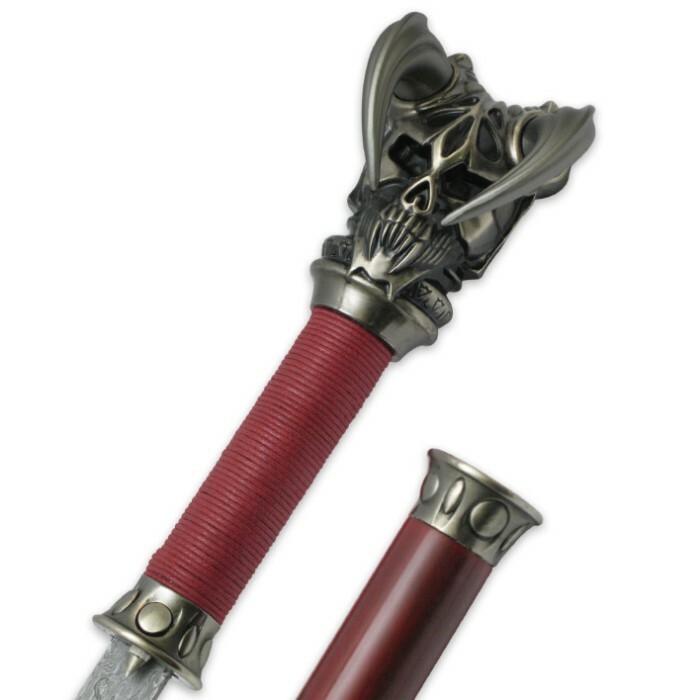 It's a different take on his popular Vorthelok sword, from the Swords of the Ancients collection. The fully functional sword cane has a 26" folded Damascus blade that locks securely into the wooden cane shaft. The blade unlocks with a push of a button hidden in the cast metal fitting. The pommel is wrought in the horned skull image of Evruc and the blade is engraved with Anglecal runes that translate as “Out of Darkness Comes Light”. The handle offers a firm and comfortable grip and features a dark red, waxed-cotton cord wrap. This sword cane has good positive lock up, good and tight. No rattles of any sort and the pommel is just insanely weighted. you could just throw the cane and knock a fella down and stone cold out! blade has a nice Damascus pattern and is fairly sharp. One gripe that is easily fixed is that this cane like the other Kit Rae sword cane I own has a cheap rubber tip. its kind of a small thing but this person thinks that it wouldn't cost united cutlery but a few more cents to adorn a proper rubber foot! 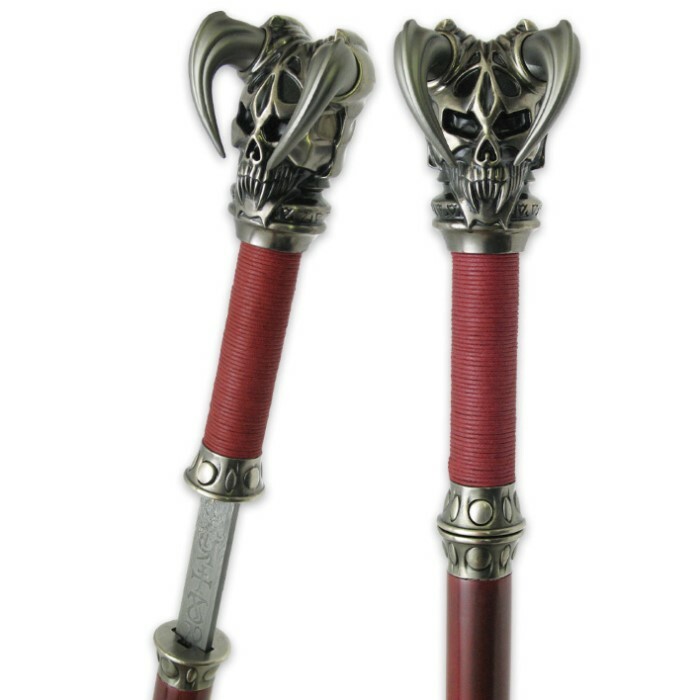 This sword cane oozes of detail and quality. really nice sword i love the quality and the sharpness of the blade my only issue is the grip is starting to come off. Went out today as I was walking my hip went out the vorthelok Cane took my weight just fine I'm so impressed with the Cane! I put about 70 lbs weight on it and it worked great! And was comfortable to my hand I have to admit I really love this Cane! I was very pleased with the vorthelok sword Cane" it does have a little rattle when walking with it" it's not gonna handle full weight and you have to get use to the grip" which I have already I weigh 180lbs and use it more for balance than weight although it does work to take the weight off my hip! I love the 26" Damascus blade it was sharp but all my blades are like a razor" yes sharp enough to shave with! Only took me an hour to get it that way! It's a little top heavy but hey when you like to be different" you learn to handle it! When you draw the sword the weight is perfect! After sharping it" it slipped out of my hand and went through my desk chair cloth with 6" of padding that was awesome no pressure at all! Bottom line it's an Awesome Cane from Kit Rae! I'm planning on making a youtube video so people can see everything about the Cane! Thanks BUDK great shipping and a great company!